A thunderstorm moves across John Redmond Reservoir in Kansas on Wednesday. Several thunderstorms turned severe as they moved through Kansas, Oklahoma and Texas. James Bradley shows a piece of hail left from a storm that smashed out his apartment's windows Thursday, March 24, 2016, in Plano, Texas. The National Weather Service says storms in Wise, Denton and Cook County produced some hail the size of ping-pong balls. However, no one had the baseball-sized that variety many expected. Weather Service Meteorologist Matt Stalley says that's because several storms developed at the same time. "And they immediately formed kind of into a line structure as opposed to staying more isolated or discrete,” he told KERA. “When that happens, the threat can rapidly transition from hail over to damaging winds instead." Strong winds did manage to topple utility poles and trees, downing power lines in parts of North Texas. Oncor reported more than 22,000 people without power Thursday morning. No significant structural damage has been reported in Dallas-Fort Worth. 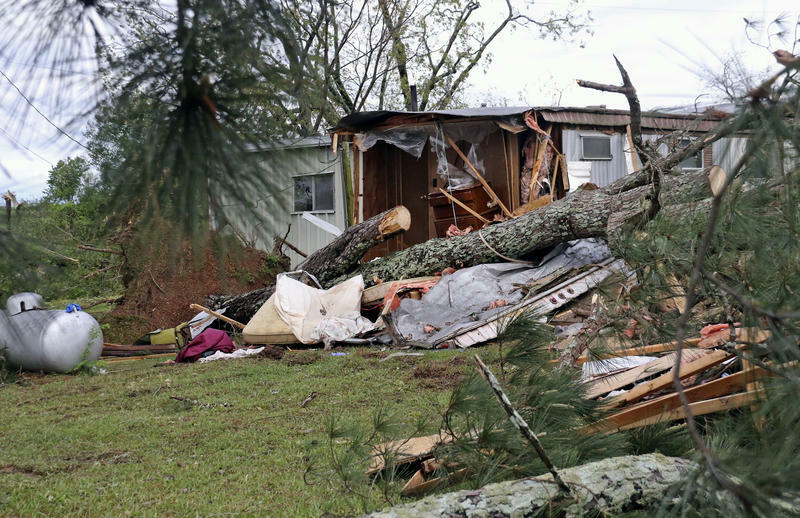 Severe thunderstorms rumbled across not just North Texas, but also the Texas Panhandle, Oklahoma and southeastern Kansas, producing several tornadoes and unleashing widespread hail. Seven tornadoes were reported across the Plains from the northeastern Texas Panhandle to southeastern Kansas. The National Weather Service received numerous reports of hail pelting the storm-struck areas. Our original post from Wednesday: Severe thunderstorms are in the forecast for North Texas — and the National Weather Service says they could roll in starting Wednesday afternoon. The main threat as the evening progresses will be large hail — some the size of baseballs — with a chance of damaging winds and an isolated tornado. 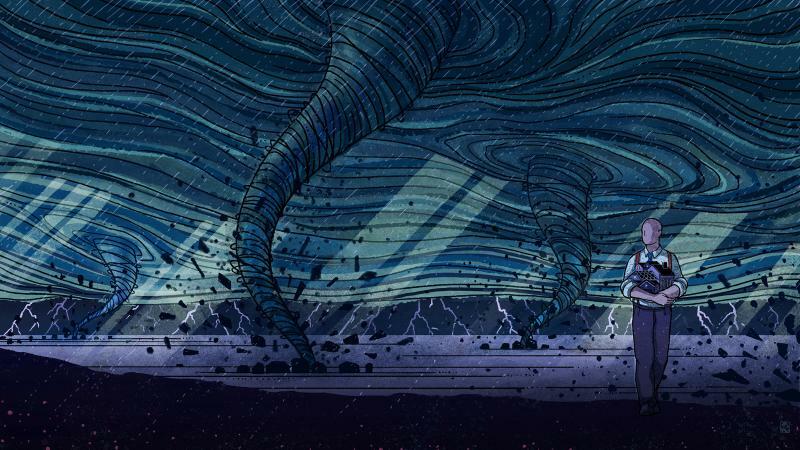 There could be up to three different areas of storms, all heading in different directions and each with different timing and hazards, the weather service says. » The first round of storms could hit east of Dallas-Fort Worth after 3 p.m. Large hail and a few tornadoes are possible. 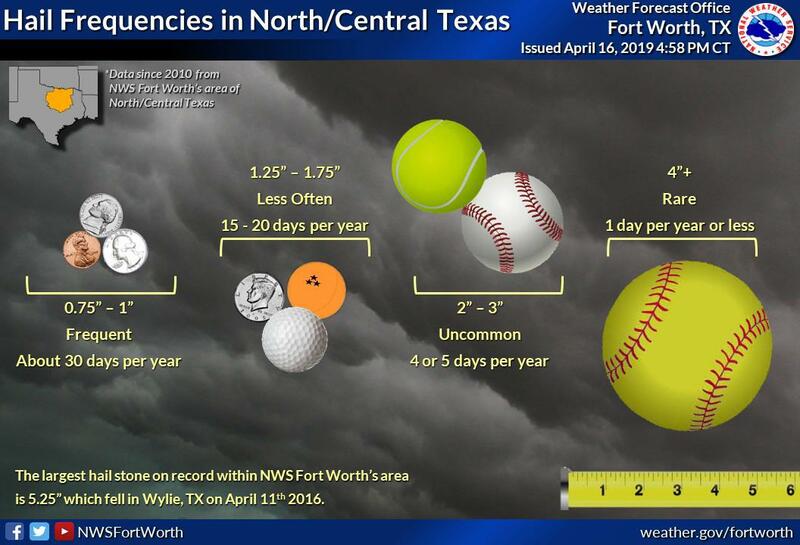 » The second round could arrive after 5 p.m. and directly affect Dallas-Fort Worth. 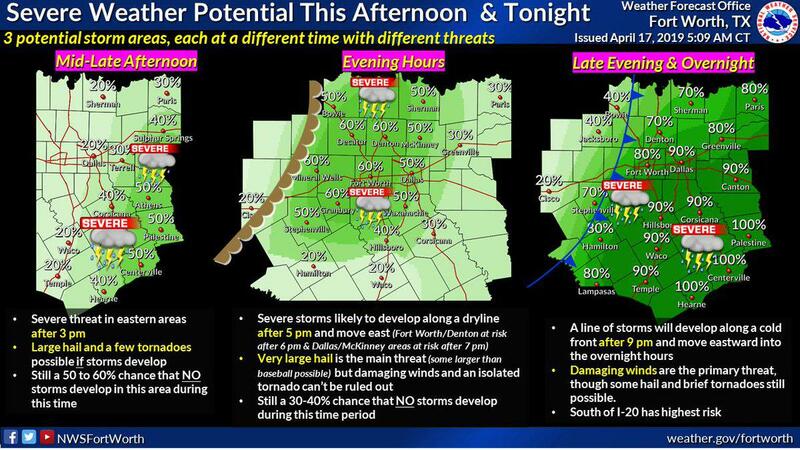 Fort Worth and Denton are at highest risk after 6 p.m. The Dallas and McKinney areas are at highest risk around 7 p.m. and later. » Later, another line of storms could develop along a cold front around 9 p.m. While all of North Texas could see rain, areas east and south of Dallas-Fort Worth — particularly south of Interstate 20 — could have the highest risk of severe weather. Storms will move east overnight. The National Weather Service's forecast for Wednesday's storms. Check the North Texas National Weather Service office on Twitter for changes and updates. Several North Texas school districts are canceling after-school activities Wednesday or ending them early due to the weather forecast. The Dallas school district says all after-school activities will end by 4:30 p.m. Fort Worth ISD says events at campuses that go past 5 p.m. have been cancelled. The Irving school district says it's canceling all after-school activities, including after-school care. Several colleges have closed early. Collin College closed at 1 p.m. The University of Texas at Dallas has canceled classes and activities after 3 p.m. Texas Christian University closed at 3 p.m.
Flights are being canceled or delayed at Dallas Love Field. Officials at Love Field and Dallas-Fort Worth International Airport encourage travelers to check with their airlines for updates. American Airlines has reduced Wednesday night's operations at Dallas-Fort Worth International -- resulting in about 100 flight cancelations. Expect no arrivals after 9 p.m. Wednesday. American says it's also limiting the number of aircraft at the airport overnight. Depending on when and where bad weather develops, motorists on their way home from work Wednesday could run into hail. If you're caught in hail while on the road, never park your vehicle under an overpass, the National Weather Service in Fort Worth warns. Your car won't be protected from damage, and you might even cause an accident. If that happens, the National Weather Service is reminding all motorists: Don't stop your vehicle under an overpass to wait it out. Not only do bridges not protect your car from wind-driven hail, sheltering under one blocks traffic and could cause a multi-car pile-up. Leave work early, if possible. Take an alternate, non-highway route that would allow you to duck your vehicle into, for instance, a shopping center parking garage. 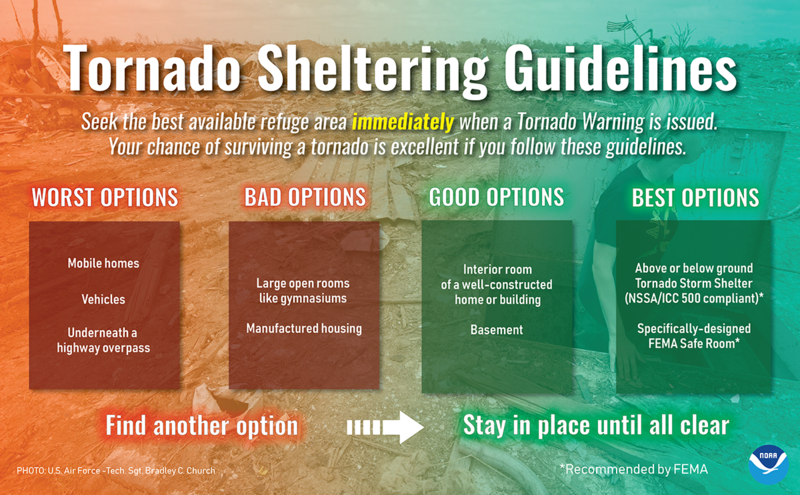 Best scenario: Plan to be in a sturdy, strong building by this time. RELATED | What Makes People Heed A Weather Warning — Or Not? Monitor local TV and radio throughout the afternoon and evening. Storm watches and warnings may be issued throughout the day. If a watch is issued, that means conditions are favorable for severe weather to develop, or they're already developing. » Stay away from windows. KERA's Miguel Perez and The Associated Press contributed to this report.